Forget about chicken tacos in the Crock Pot or beef tacos in the skillet! 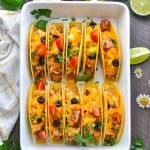 These Dump-and-Bake Chicken Tacos are on the table in less than 20 minutes, making them the easiest and fastest way to serve tacos to your family! They're crispy, creamy, zesty, and 100% kid-approved for quick last-minute dinners! Preheat oven to 400 degrees F. Spray a 9 x 13-inch baking dish with cooking spray and set aside. In a large bowl, stir together chicken, sour cream, and taco seasoning. To assemble, spread about 2 tablespoons of refried beans in the bottom of each shell. Top each shell with about ¼ cup of the chicken mixture and 2 tablespoons of cheese. Arrange stuffed taco shells, standing up, in the prepared baking dish. Bake for 5-7 minutes, or until cheese is melted and tacos are heated through. Garnish with optional toppings and serve. Cooking Just for Two? Cut the ingredients in half and bake the chicken tacos in an 8-inch or 9-inch square dish. Serving a Larger Crowd? Double the ingredients and use two large baking dishes to prepare twice as many tacos!